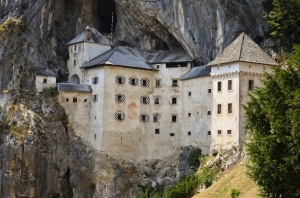 Located nearby the town of Postojna in Slovenia, Predjama Castle is a unique residence among the numerous group of medieval castles in Europe. Although it is rather small, it undoubtedly deserves the title of one of the most extraordinary castles in the world. This is primarily due to the fact that most of the castle rooms are simply inside a huge cave whose entrance is closed by its facade. The oldest castle in the Balkans is protected by nature itself which provides better safety for its owners than any walls, deep moats or watch towers. This unusual stronghold, whose walls are literally merged with the high vertical rock, was first mentioned in sources from the 13th century. It is known that the owners of the castle in 1274 were members of a knight family whose name derives from their place of residence. 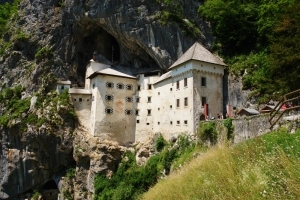 «Jama» from Slovenian means «a cave», that is why the castle built in front of an entry to a huge hollow was called Predjama Castle. German historic chronicles say that the castle owners, liegemen of powerful feudal rulers – the Bishops of Aquileia, were called Lueg knights. During a tour around the castle, which was renovated in the 1990s, you can visit the interior and walk in the underground labyrinths. Undoubtedly, such a tour should be led by an experienced guide who will spare tourists the trouble related to being lost among countless passages and tunnels. Some parts of the caves, where residential rooms are, are connected to an extensive system of corridors at several levels, reaching the height of approx. 140 metres. 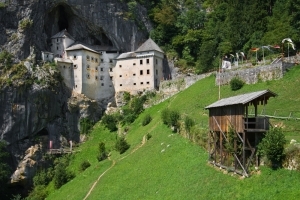 Inside the castle, near the entry to a six kilometres long cave, you can see the remains of the same «Erazm» Castle. 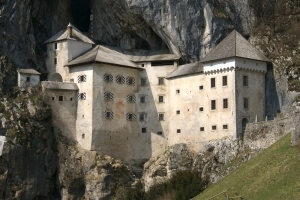 Built within a rock, Predjama Castle lacked a spacious inner courtyard, so typical for most of the medieval buildings of that type. That is why some facilities were used both for living and for utility purposes. A suspension bridge leads to a room for guards behind which is a defensive hall where rocks and hot tar were thrown down on the heads of enemies. In the stronghold there is also a court room as well as an adjoining torture chamber where guilty people were sent to. In the castle chambers there are reconstructed medieval furnishings and equipment used in everyday life in that period. Among the museum’s collections you can see the examples of weapons or art objects. A sculpture of Our Lady of Sorrows, made in 1420, is regarded as the most valuable item in the collection. On the castle premises there was a small chapel with a priest's room located nearby. The priest's responsibilities included not only celebrating masses but also writing the castle chronicles. 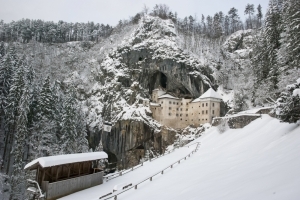 Some years ago, a tradition of a knight tournament dedicated to Erazm Lügger was established in Predjama Castle. This colourful costume holiday, for which a wide group of participants and guests arrive, ends with a medieval reception with folk music. 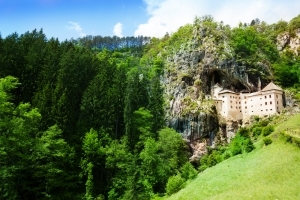 From the end of spring till late autumn tourists can take part in tours around the picturesque caves under the castle as well as the Upper secret passage leading to the small woods on the top of the castle rock. November - March - from 10:00 a.m. to 4:00 p.m.
April, October - from 10:00 a.m. to 5:00 p.m.
May, June, September - from 09:00 a.m. to 6:00 p.m.
July-August - from 09:00 a.m. to 7:00 p.m.